Be unique. That is something to always keep in mind. Most of the world dissipates into a sea of normal, bland, non-enthusiastic blah-ness (not a word, I am aware). 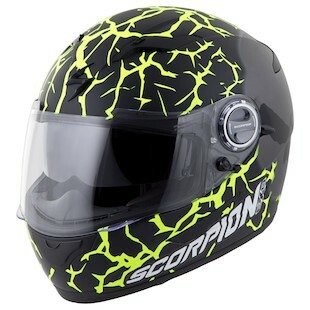 If you are more inclined to be different, then check out the new Scorpion EXO-500 Numbskull Helmet. Built upon the blueprint of the very popular EXO-500, the Numbskull graphic certainly stands out in a crowd. Introduced in 2011, the EXO-500 makes use of three shell sizes with a polycarbonate construction and an intermediate fit. Internal features such as the Kwikwick2 liner, airfit cheek system, and internal drop-down sun visor make this a huge bang-for-your-buck option. The Numbskull graphic gives the helmet a fractured feel reminiscent of a thicket of thorns throughout, while the shaded gaze of a Punisher-style skull peers out from either side. If you are a rider looking for great value and a unique look, the EXO-500 Numbskull Helmet should be high on your list.